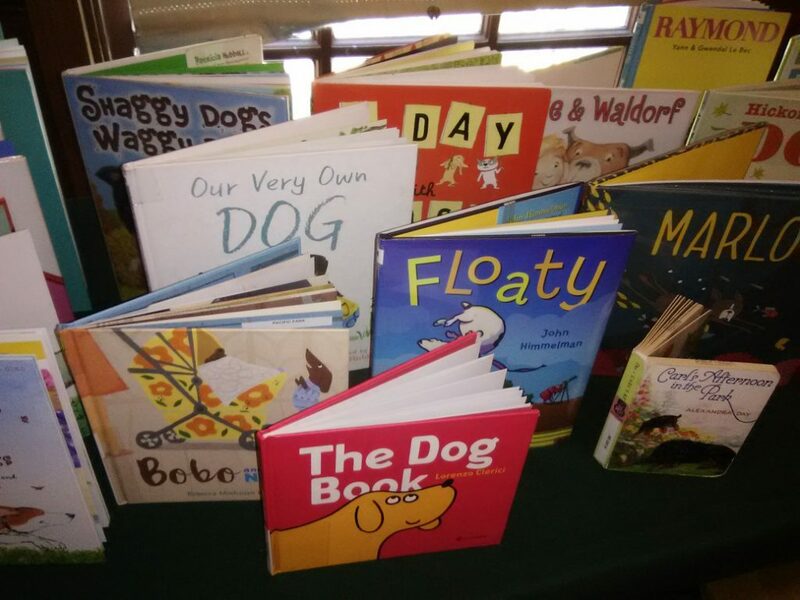 On Saturday, we told stories about dogs! In Frankie by Mary Sullivan, Frankie is a newly-adopted dog who is trying to get to used to his new home, while Nico, another dog already living in the house, resents Frankie for playing with his toys and lying on his bed. Nico doesn’t want to share. Frankie figures out how to make his own fun and develop his own collection of stuff, until his owner comes home with lots of stuff just for Frankie! Now the question is, will Frankie share with Nico? 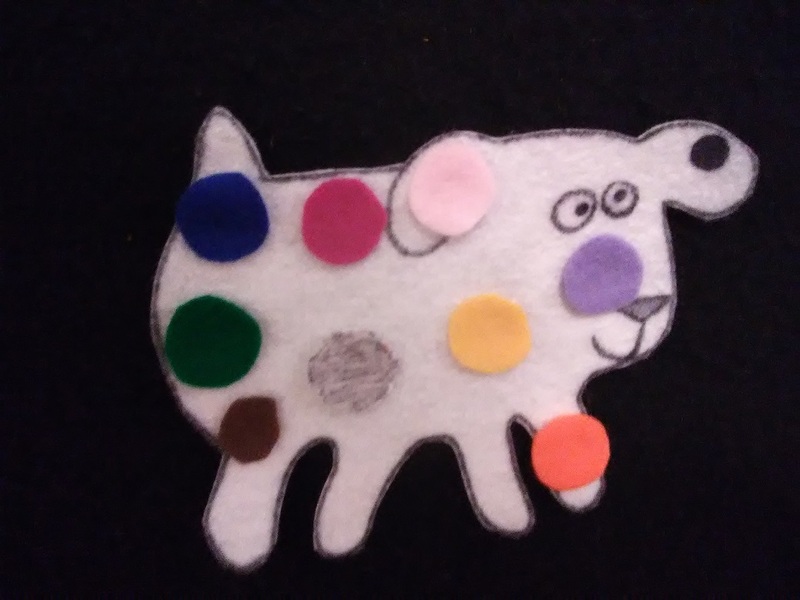 In The Very Very Very Long Dog by Julia Patton, a sausage dog named Bartleby keeps getting into trouble because he is so long, he can’t keep track of his rear end! Fortunately, his friends are there to clean up the mess and make for him a very “STEAM” solution to his problem. In A Cat is Better by Linda Joy Singleton and illustrated by Jorge Martin, we hear a feline’s opinion on the subject of dogs. But in the end, the cat can’t argue with the fact that, when you’re scared or blue, a dog is nice to have as a friend! Bark, George by Jules Feiffer is a classic about a dog who keeps making the sounds of other animals, until a veterinarian discovers that he has all kinds of animals in his stomach. 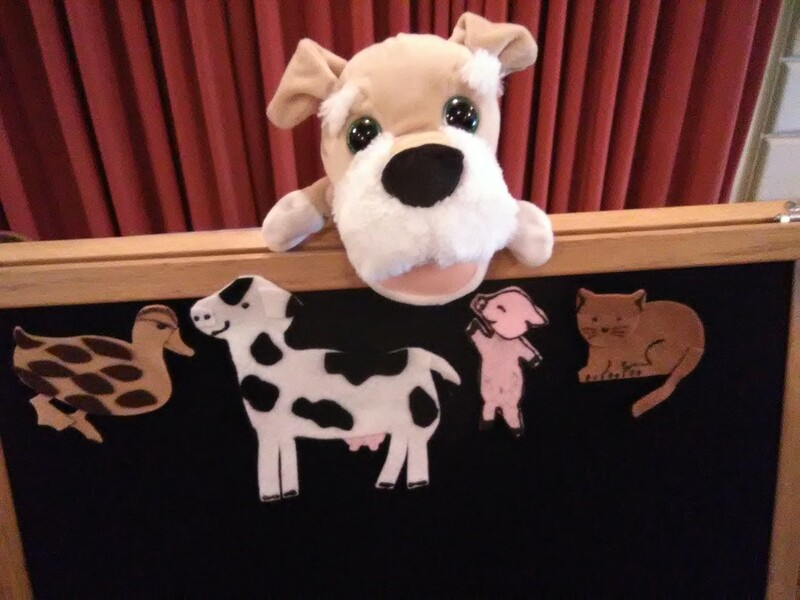 Instead of showing the book (with its slightly scary illustrations) I used a dog puppet to tell the story, and at the part where the vet pulls animals out of his stomach, I had some felt animals hidden up the “sleeve” of the puppet. We used the flannelboard to talk about colors with a story based on Dog’s Colorful Day. We added spots to the dog and counted them as Dog encountered spills of paint, drops of ice cream and smudges of mud! “Song in My Tummy” from The Best of the Laurie Berkner Band. “Bingo” from Wiggleworms Love You by Old Town School of Folk Music. We watched “No Roses for Harry” from the DVD Harry The Dirty Dog, based on the book by Gene Zion and illustrated by Margaret Bloy Graham. If you’d like to join us for Barks and Books and read with some real live dogs, we have volunteers from the Humane Society coming on Saturday at 11 am, with their adorable and gentle dogs. 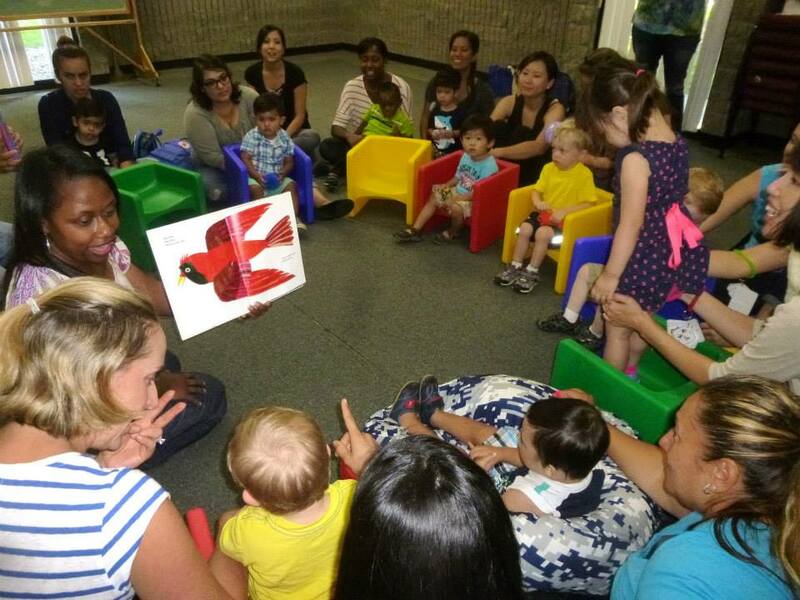 It’s great for encouraging kids who are already learning how to read and need the practice, but I’m sure the dog would enjoy hearing a story together with a prereader!